Fig. 30 Cost-based pricing. 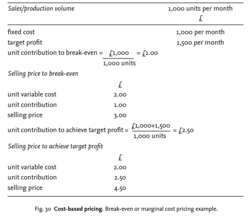 Break-even or marginal cost pricing example. Fig. 29 Cost-based pricing. Full cost or mark-up pricing example. break-even or target-profit or marginal cost pricing of a product is based upon the CONTRIBUTION needed for the product to BREAK EVEN or provide a predetermined target profit. Fig. 30 shows an example of break-even pricing based on an estimated sales/production volume of 1,000 units per month and total fixed costs (depreciation, rent, etc.) of £1,000 per month. Unit contribution is simply the difference between selling price and unit variable cost or marginal cost. Unit contribution, when multiplied by sales/production volume gives total contribution, and this total contribution should provide sufficient money to cover fixed costs (to break even) or fixed costs and target profit. Fig. 30 shows the unit contribution required in each case. To calculate selling price it is necessary to add unit contribution to unit variable cost or marginal cost as shown in Fig. 30. All three pricing methods are cost-based and to this extent appear to ignore demand. However, demand and competition cannot be ignored in setting prices. For instance, in full-cost and break-even pricing, estimates of sales volume are necessary to calculate average fixed cost and required unit contribution respectively. Yet in both cases the price charged will affect sales volume. In practice, managers take account of demand or competition, so that in using full-cost pricing they tend to vary the percentage mark-up over time to reflect fluctuations in demand, and to use different percentage mark-ups for different products to reflect differences in the intensity of competition. See DEMAND-BASED PRICING, COMPETITION-BASED PRICING. pricing methods that determine the PRICE of a product on the basis of its production, distribution and marketing costs. See AVERAGE-COST PRICING, FULL-COST PRICING, MARGINAL-COST PRICING. As fixed prices replace fee-for-service, and price-based costing substitute cost-based pricing, providers must prepare early to garner maximum benefit. A section of the industry, however, also concedes that the regulator was incrementally moving things in the manner the industry wanted - it allowed cost-based pricing to market-based pricing. Over time they will get adjusted to the cost-based pricing," the expert said. Despite challenges, ABC is expected to draw more attention as efficient cost-based pricing becomes essential for retaining and attracting more patients. So should a business use cost-based pricing instead of price-based costing? Price check: is price-based costing or cost-based pricing best? Even for non-patented drugs, the policy has moved from cost-based pricing to market-based pricing. Using cost-based pricing formulas, the National Pharmaceutical Pricing Authority (NPPA) already sets prices for domestic drug companies' products. Natural gas market experts attributed the loss to relatively higher amounts paid for natural gas imports as well as the lack of a cost-based pricing mechanism. Attempts to advance healthcare access via cost-based pricing miss the point that lack of infrastructure and appropriate delivery systems are needed to boost access. Under the price discrimination hypothesis, a good's price depends on its relative position in a firm's product line, whereas under cost-based pricing, (1) the price of a good is independent of the other goods in the product line; that is, under the price discrimination hypothesis, the prices of the same quantity of a good sold in two different outlets will differ depending on whether larger and/or smaller quantities of that good are sold at each outlet. Examining the ten industrial service pricing articles that relate to price composition, the aforementioned importance of cost-based pricing is affirmed.